Fancy playing on the best club track in Cambridgeshire, at FitzWilliam College Sports Ground? It's a 10 minute cycle ride from central Cambridge. We welcome new players, particularly players for our 1st and 2nd XI teams. Why not roll up to our Winter nets, at Fenners Indoor Cricket Centre, Gresham Road entrance? 4th XI plays in the Junior League 4 West, traditionally on Parker's Piece. However, the council has recently relaid the pitch on Parker's Piece. For the 2019 season, the 3rd and 4th XI will be a bit nomadic, mostly sharing Trinity Hall and Comberton. We are grateful to those clubs for their assistance. We’re an inclusive, diverse and welcoming club. We provide opportunities for all to play competitive and recreational cricket across a broad range of abilities. Our teams comprise long-term Cambridge residents, ex-residents, some living in London, University students and retirees. Winter nets for 2019 are for both men and women. They are every Tuesday from the 5th February until 30th April, with all welcome. The times are 7pm-9pm. The venue is the Cambridge University Indoor Cricket Nets on Gresham Road, Cambridge. We book all three lanes, so you practice with a group of similar ability. From May to Mid-August nets continue at Netherhall School on Thursday evenings 7pm. October and November: Often a smaller group practices at Hills Road, typically 8pm on Wednesdays. Steve Taylor is our inspirational club coach. He has 282 club appearances, and has scored over 4,064 runs for NCI. This places him 5th on both counts in our all time ranking since 2001. We appreciate his time and his support for our club. Note that Steve does not offer unsolicited advice. Some players may not want advice. So, just ask him for his thoughts and insights. He is wonderfully astute. Steve also offers individual batting and bowling coaching sessions. 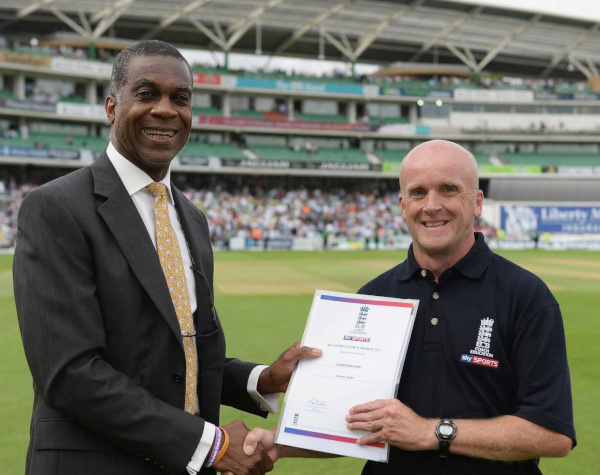 Steve Taylor cricket coach, Holding a coaching award. He's the chap on the right hand side, alas. Membership of our parent club, the NCI Sports and Social Club. It you were registered with another club, please advise us. We'll apply for your registration to transfer to Cambridge NCI CC.